hihihi.. ok, so i changed the template again.. erm.. i like the previous template, but the color was so.. dull! Grey! So, i used the first template (the one before the grey temp.) and i altered here and there.. So how..? do u like it..? * yeah, i know, i have yet to set the margin of the posts but that one later lah..
Erm.. Uda has left for UITM junior orientation and her new semester last Sunday...Although it has been just about 4 or 5 days, feels like forever! 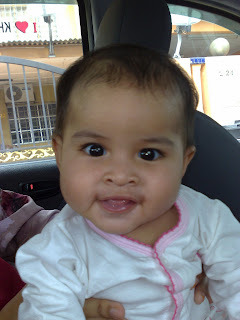 Ye lah, Uda used to help us around the house.. *especially in helping to take care of the cute Alia.. hihi..
Hm.. Acu pulak will be gone this Sunday. 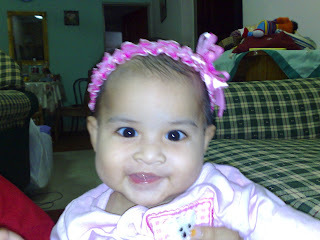 She will enroll for her Biology Course at UKM (can u imagine? 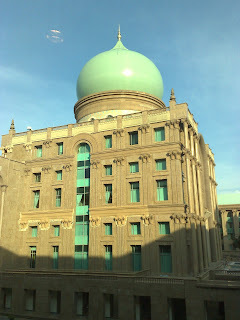 I used to DREAM of studying there.. 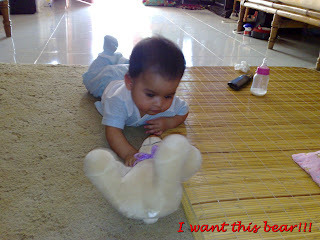 But Acu yang dapat peluang to study there.. bestnyer.. 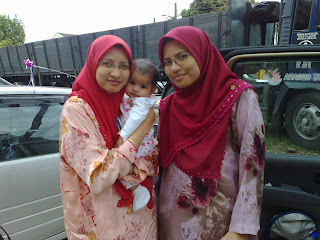 So, babai Ika... hihi..
Get well soon, si comel..
**erm... i was too preoccupied with the altering the layout of the template, tu yang x sempat jenguk blog member2 lain.. sori ye.... ampun! 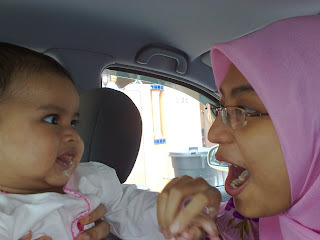 hihi..
erm.. tajuk tu agak exaggerate sikit.. actually gini, ubat SingulAir yg Alia duk makan ari-ari tu dah abih.. and actually by consuming that ubat, she has some sort of barrier against cold and cough. 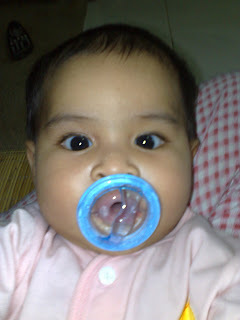 so, when the medicine was finished, i thought she sudah sembuh sepenuhnya.. so i didn't bother to go out and buy some more.. HOWEVER, just 1 day after that, after she came home from nursery, i can hear coughing.. but it was already late to go out and look after the SingulAir.. So, we decided to buy it the next day. And after several visits (5 visits, to be exact) to local pharmacy, we managed to buy the medicine.. and it was SOOOOO expensive! imagine, one sachet (4 grams) costs about RM8! 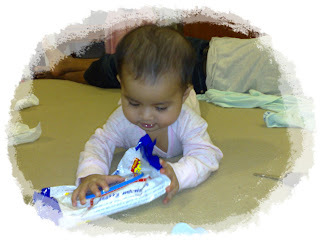 and if we were to buy a whole box (about 28 sachets), it will cost around RM100+.. heheh.. so mahal la ubat Alia..
That very night we gave Alia her SingulAir.. 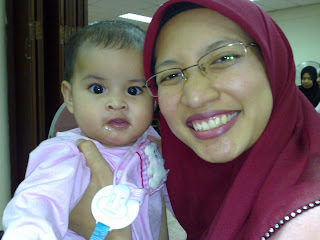 The day after it, after we fetched Alia from the nursery, we can hear her coughing ~ and it was so bad! 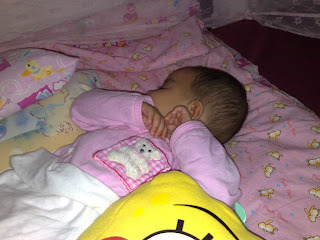 (much worse than before..) and we can hear some mucous when she breathed..
That night, Alia cought some fever.. 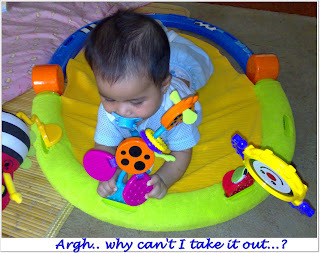 I gave her some Paracetamol.. She played.. and then went to sleep.. In the middle of the night, she woke up. Asked for some milk.. I held her head, and she was so hot! I started to panic! 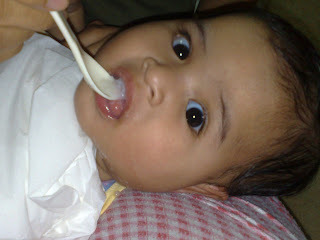 My beloved hubby gave Alia some Paracetamol. And she went to sleep again..
* This morning, when i was sending Alia to her nursery, when i put her down, i can hear the baby beside her coughing! (in my thought : Ceh! this is the culprit!!!!) erm.. gitu lah..
As u all know, i am so lazy in making bubur for Alia..
** actually not that i'm so malas, just that the blender is not in the picture yet.. 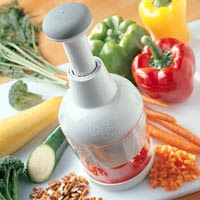 I went to Giant yesterday, and the cheapect blender was about 70/=.. hmm.. so much for a bubur eh..? So today, i have found 1 solution..
Well, how did we spend the weekend...? 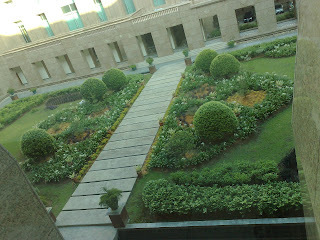 Just the normal routine ~ wake up, had breakfast, bathe Alia.. and then around 10 in the morning, the house went oh so quite! know why..? 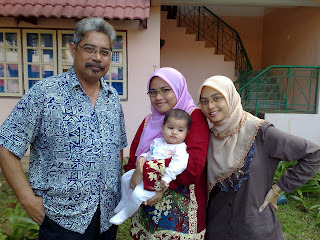 ~Atuk, Wan, Acu n Uda ~ went to the engagement of my anak buah (Along - anak Pak Ngah). 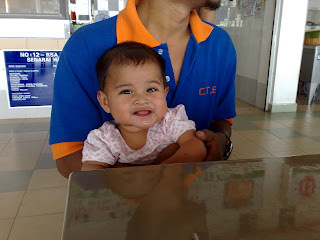 Rasa macam budak je lagi dia tuh.. hihi..
~ Ayah ALia ~ he went to our house (yup, the one and only..) to supervise the Glomac people who will come over and install some pipes etc..
~So, in the end, there were just Alia and me.. hihi.. 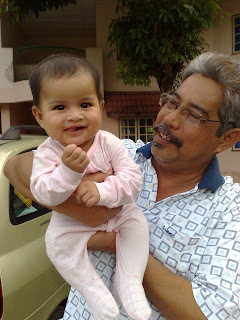 So, how did Alia spent her Saturday afternoon with me..? Same thing ~ woke up, sarapan.. mandikan Alia..
~around 10 ~we all (yes, all : Atuk, Wan, Acu, Uda, Ayah Alia, Ibu Alia and Alia) went to see our house (again..!) hihi.. this time around, Atuk and Wan would like to see up close, and maybe give some inputs..
And we took Atuk n Wan to this Ah Hock. **Nearby, there's this one company who rented a house. And they made the house as their so called showroom. 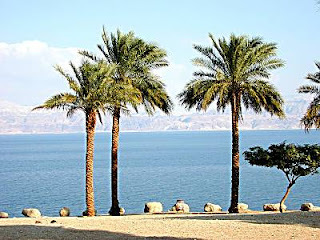 My hubby and I went there once and took a look at their kitchen cabinet. I thought that it was erm.. 'not so attractive'. But my hubby said it was ok. So, we took this opportunity to bring Atuk n Wan to see the cabinet for themselves! And they said ok too! 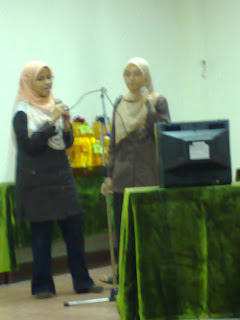 hmm... i guess i was being so cerewet.. hihi.. moreover, it was cheap. 6 K! 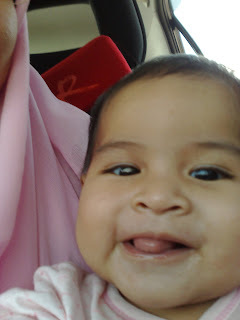 i already surveyed and i found out that 'nice' cabinets will cost around 20 K something.. hmm..
Take a look at Alia's BORING face.. hihi.. sian dia..
Pada hari kami pegi check up itu, petang tu terus ibu alia buat bubur.. heheh..
so, inilah rupa alia pada cubaan pertama makan bubur nasi..
Saya tau, mesti anda semua tertanya-tanya kenapa puting ini sungguh pelik (ataupun hodoh..), kan? hihi.. sebenarnya Ibu Alia ada satu lagi tabiat ~ suka beli puting! So, ini puting Alia yg terbaru..
*thanx to mimi who introduced this to me..
ok, saya tatau nak bagitau camne..
Kalau anda perasan, pada seat hadapan kereta, di atas kepala tu ada benda alah yg kita guna time silau/panas dan dilengkapi dengan cermin, kan..? Beberapa hari yang lalu saya perasan Alia pandang ke situ dan senyum sorang-sorang..
hihi.. sampai ke hari ini, kalau dia bosan tengok kereta lalu lalang, dia akan tengok cermin itu! Anak-anak anda semua pernah tak main-main gitu...? 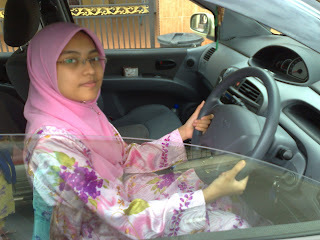 :) hihi..
you can pay people to TEACH you, but you can't pay people to CARE for you..
hihi.. Like the new look..? However, after i changed the template to this one, i kinda frustrated coz A LOT of things has 'disappear'.. and i have to install them again! -widgets : that can be taken care of..
-Link list : This may be a prob to me.. Therefore, i will try to add YOUR LINK at the link list.. if it is not there, please inform me, ya! 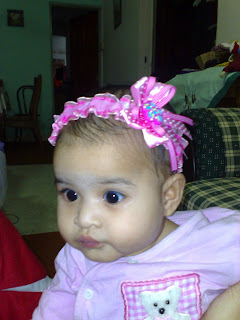 erm.. actually nothing much has happened for the past few days..
- Alia's 6-months' check up.. 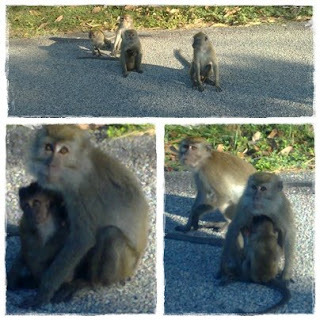 So, early in the morning.. we headed to Tanglin Clinic.. Not far from my office (and Wan's office too!). Actually, this appointment was supposed to be on Thursday (last week), but since we (ibu n ayah Alia) had meeting at JPM, we have to postpone it to last tuesday..
As usual, not many people there, just about 2 or 3 pregnant ladies with their hubbies.. within 5 minutes, the nurse called upon Alia and took her weight and height. 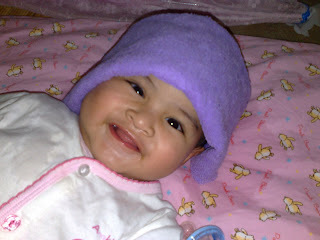 And after that, consultation session..
-Alia's weight now is 6.6 kg (merely 0.5 kg increased of a period one month). The nurse : dah start bagi makanan pelengkap ke..? The nurse : bagi makan apa? 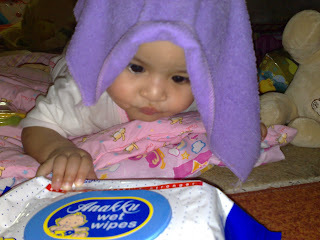 Me : Saya bagi biskut je.. (we gave Farley's rusk). Tak berani nak bagi bubur, pasal baru lagi.. The nurse : EH... MANA LEH GITU? KENA BAGi BUBUR! KALAU TAK MANA DIA ADA TENAGA.. SEKARANG NI DIA BANYAK GUNA TENAGA DAH..
heheh.. padan muka saya.. tu lah, aritu lagi my friend Hanny has told me to give ALia bubur, but i said later la.. hihi.. now i have to be extra rajin a bit la.. heheh.. 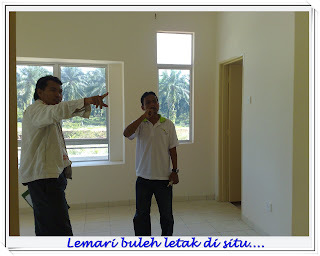 So, after that we headed to Saujana Utama and we were given the keys to our new house..
overall ~ ok la, although they still have yet to wash n polish the floor.. So now, my plan is to search for reliable contractors who do kitchen cabinet. 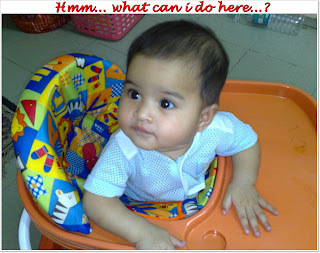 CAN YOU HELP ME...? :) pleeeaaassseeee..... thank you in advance.. I've never been there, but for the rest of my family, this might be their 2nd or 3rd visit.. 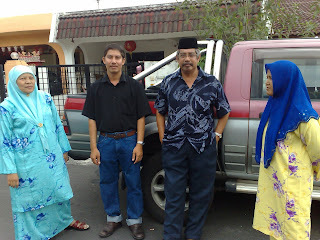 They used to come to Cherating to play kite after sending me to KUSTEM in T'ganu. 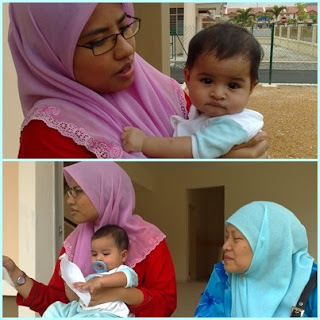 This family day was for the Rukun Tetangga around my neighbourhood..
As usual, i had to stay indoor to take care of lil Alia who plays n sleeps.. This time, there were no stalls selling banana, so my dad had to settle with some groundnuts.. erm.. my hubby donated his Nata de Coco to them.. and i think the kera liked it! We headed home on Sunday. But before we made a move,we went to visit a 'Kompleks Kraf' or something.. 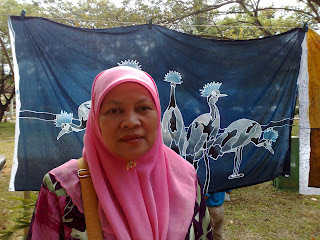 It was undergoing some renovation works... We had to see a Batik Painting Show.. I stayed for just about 10 minutes.. Alia was kinda resah gelisah coz it was a bit hot and stuffy..
Fuh.. That's all for now.. tq! It was a little bit intimidating, coz i've never been here before.. But the view were so breathtaking! 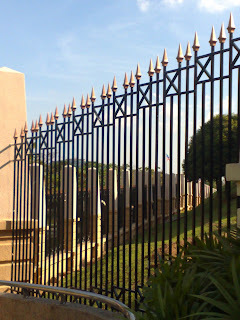 so cantek oo..
CAN U GUESS WHERE in Malaysia have gates like this...? 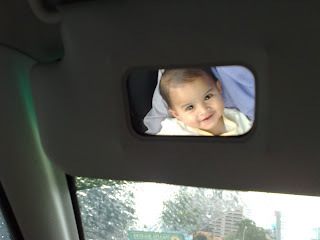 Alia will smile when she sees her reflection or other people's.. hihi..
ahh.. somebody urged me to update, huh..? 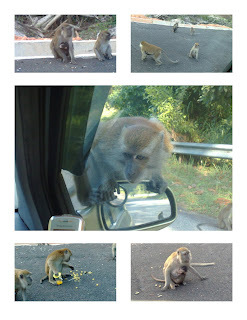 hihii..
erm.. a few days ago i went to Ratu Hati .. and guess what...? 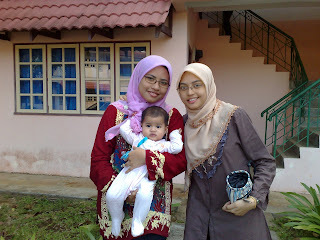 erm.. oh ya, if u would like to put ur child's photo there, just sign up, and post it at Album>hantar gambar, ya! Erm.. i know it has been quite some time since my last entry.. i dunno why, for some reasons, i feel so lazy to update.. hahah..
oh well, last weekend on Saturday we all (except Alia's Ayah - he has to work..) went to the Pak Sheikh's Daughter wedding.. Pak Sheikh is my dad's friend.. and i used to home tuition his other daughter..(not the one who was getting married!).. Alia's dad again, missing in action - he had to do some errands.. i guess he is a kinda guy that doesn't like to go to occasions.. hmm.. 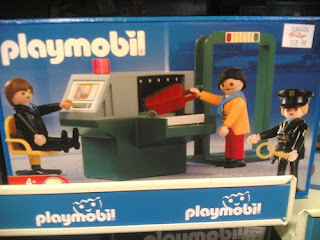 So, how does she feels about it..? 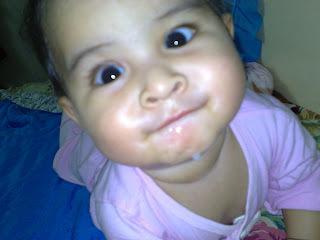 Alia's so called FIRST PHASE! 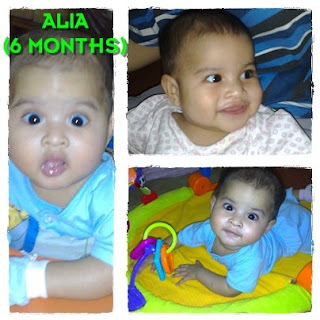 Alia turns 6 months old! Guess what? 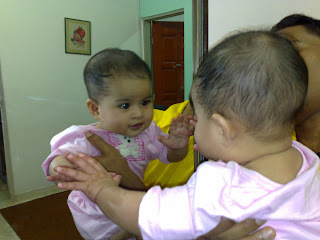 yesterday (2nd June 08), Alia turns 6 months old! 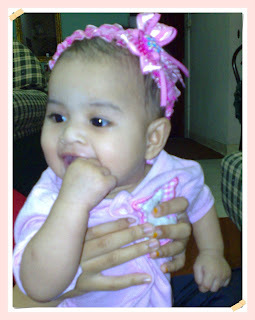 wah.. how time flew so quickly..
~ She can giggles! yes.. when we do the agah, or 'Chak!' she will smile and sometimes giggles..
~ She loves it when i bathe her (long-long time ago - during my confinement period, she used to cry when we bathe her.. dunno why..) Lucky it has now gone! I guess that's all... haha.. can't wait to see her run! 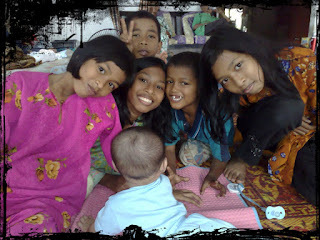 But before we checked in, my hubby, Alia and I went to visit my in-laws at Bruas..
6Here are some of Alia's cousins n nephews : But we didn't stay there long.. around 6.00 pm, we went to the resort.. 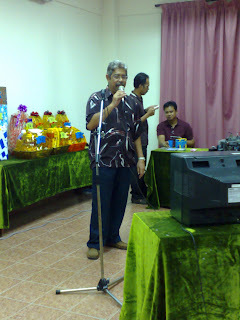 So, let's see who were there at the resort : Atuk, Wan, Uda, Acu, Me and of course ALia! We managed to get a 'Duplex room' on the 2nd day. Alhamdulillah.. more spacious!